Don't miss HELLO! Fashion Monthly's 196-page 'Fashion Special' - showcasing key trends for Autumn/Winter as well as a FREE 50-page catwalk guide - for just £1. Order your copy by clicking below or take out a subscription to HELLO! 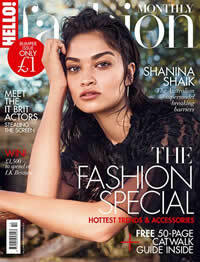 Fashion Monthly (HFM) to receive this Fashion Special for FREE as well as receiving 7 FREE Lee Stafford hair products worth £43. Pay just £6 for 6 months and also receive free delivery of every issue - and before it's available on the newsstand. Every month, HFM provides a mix of fabulous high street finds combined with high-end fashion and beauty must-haves. Blending practical advice, aspirational fashion shoots, trends to inspire as well as exclusive interviews with celebrities, designers and fashion insiders, HFM is your monthly fashion and beauty fix.